Howdy, Leaguers. It's the start of a new month. That means a few things around League HQ. Sadly, nobody seems to think that Kid Rock and Pam Anderson will find wedded bliss, tiptoeing through the fallout. Or that the Candaians stand a darn chance of finally letting the people decide the fate of their own nation. Nor do any of you worry too much about the fate of your dear old grannies. You lousy jerks. Rather, a surprising 1 in 3 of you crybabies were worried about finding drinking water after the initial atomic exchange. 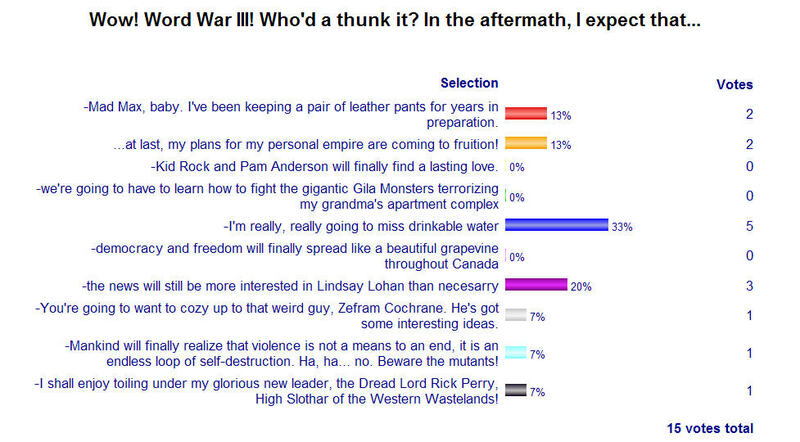 1 in 5 of you have plainly had it with Lohan. 1 of you got my Star Trek reference. Thanks, Steanso. You may now hang your head in shame. 1 of you fears the mutants. And only one of you is prepared for the coming age and to live under the banner of the Nefarious Perry. You shall all pay for your insolence. Apparently some new BBC program is going to be a faux-documentay which takes place in the not-so-far future, detailing the (obviously) fictional 2007 assasination of President Bush and the aftermath. The CNN anchors put on their somber faces this morning when reporting about the program, reassuring the audience that it was a British film-maker and not an American who would dare have the audacity to even think of a world in which someone might touch a hair upon Fearless Leader's head. Apparently, only a monster could imagine the president being assassinated. How many movies do we watch which use the assassination (or attempt at the assassination) of the president as the plot? Yes, yes... those presidents are fictional, but it IS still the President, is it not? One of the top rated shows on TV is 24 which regularly depicts conniving and murderous members of government and routine presidential assasination attempts. The BBC program happens to use Photoshopped images of Bush instead of Dennis Haysbert. Never mind the other 10's of thousands of other murders depicted on television (not to mention movies) people are now supposed to see before they turn 18. Or the hundreds of thousands of acts of violence on television. I'm irritated that CNN (a Time/Warner subsidiary, and thus responsible for creating and broadcasting much of that programming) is playing this up as if the filmmaker has somehow performed a voodoo ritual which is dooming the President. The concerned, knitted eyebrows appeal to our dumbest jingoistic nature. Is the President no longer a mortal American citizen (of whom we don't think about twice as they're blown up nightly on television), but our own duly elected Sun God we can somehow murder with a TV show? I don't want the President dead. Neither do you. Well, yes, you in the back in the army surplus coat with the scraggly beard and crazy eyes... but you also think your house cat is trying to take over your mind. Of course it took a person in the UK to create the show. Since the 1960's it's been illegal to even think about killing the actual President in the US. A passing comment to a co-worker could be enough to have the Secret Service putting you in the cooler for a few weeks while they dug through all of your personal laundry. In a way, it's not worth the personal and financial risk. So apparently the MTV Video Music Awards sucked because they weren't "shocking enough" and the artists were boring. The problem isn't the VMA's. The problem is the state of the assembly-line music industry and MTV's belief that the people they promote are actually interesting enough to warrant the reputations they foist upon their viewership. In theory I took the day off to perform a task that I thought would be both monumental and expensive. It was neither. When our house was inspected, the inspector wrote that the patch of burned out dirt on the west side of our house (between the house and the cinderblock wall) needed soil. Erosion had apparently taken its natural course and the inspector made a note that continued erosion could get water under the foundation, which, of course, would mean the house would float away. Or something. We were to add soil, angled away from the house. Technically, a professional was to add the soil, but I figured I'm as professional as the next guy when it comes to moving dirt around with a shovel, so I dubbed myself a landscape architect for the day (and while I was at it, I was also a master geologist) and got to work. So Wednesday night, after I sold my post-1998 Star Wars figure and vehicle collection to my LCS-owner, I headed to Lowe's where I bought 15 bags of "all-purpose top soil". At $2.43 a bag, I figured that if 15 bags wasn't enough, it wasn't a big deal to come back and purchse more soil, but I also had done no math before leaving the house, so I wasn't sure if the 15 cubic feet would be enough. This morning I woke up at 6:00, ate a Power Bar, and, at the inspector's direction, laid soil at an angle in order to keep the water from flowing under the house. The entire job, plus time at Lowe's, took maybe an hour. So by 8:00, I was using the remaining five bags of dirt to add soil to my cactus garden, fill Mel's trench (Mel dug one hole in this yard. We do not know why it was a single hole, or why he dug it next to the porch. It's been there for three years. We filled it once and he dug it again), and generally put dirt in places that I thought maybe could use a little all-purpose top soil. Add water to settle the soil, and voila! I had the whole day ahead of me. I spoke to my neighbor of six months for the first time. We're both moving out in mid-September. Go figure. Our new house has a front porch (two of them, but who's counting? ), so I hope this means I might actually meet a neighbor or two if I go outside to read or whatever once we're settled in. I also got to watch single-Mom across the street chase down her kid for day 2 (I had seen her do it on Wednesday, too) as he made a mad break for the park rather than get in the car for day-care. That is one kid who wants to go the jungle gym. We did some packing and whatnot in the morning and, as we're a bit ahead of schedule (we have two more weeks and I think we'll be done packing by Monday night), we went to go see Little Miss Sunshine. At the risk of being called Satan by all the folks who adored this movie, I thought it was okay, but it wasn't something I particularly want to own on DVD. It was funny. The actors were all very good (especially the titular star of the film, who I suspect was mostly playing herself). I more or less liked the flow of the script, but I thought the actors mostly overcame the directing more than they were guided by the directing. I'd be curious to know what bits were cut from the movie. Toni Collette was good, but it seemed as if her storyline had mostly been excised from the film except as a few throw-away lines about a messy divorce (it's only insinuated but never stated that Kinnear's character is not Dwayne's father) and issues with personal finance. The story also makes an abrupt turn to the absurd in the Scottsdale/ Phoenix portion of the film that went from daffy family road trip into riffing on one of the "National Lampoon's Vacation" films. Not only did they lift the "let's drive with the dead relative" gimmick, but it happened in the same damn city as in "Vacation". The movie shows every weekend on some cable outlet, and its inevitable that the viewer would draw comparisons (or at least this viewer who has seen Vacation almost as many times as "Empire Strikes Back"). I'm not sure how that scene made it into the film, or why they felt it was necessary in an otherwise fairly grounded movie. The family's inability to grieve what would be a considerable loss put the whole structure of the film in jeopardy, reminding this viewer that these are characters, and not people. Real (sane) people do not decide to continue on to a talent show when they're dealing with their dead father. Or at least they'd send part of the party along and leave one person behind to deal with the paperwork. It just felt unnecessary and inserted purely for the following scene with the police officer. Is the movie worth seeing? Sure. Go nuts. Is it phenomenal..? You know what? I liked Superman Returns a whole lot, so what the hell do I know? I don't feel it's as fresh and new as everyone is claiming. For long stretches the movie felt like little bits lifted from other movies. But it also isn't bad. I don't want anybody to think that. I guess maybe I saw a lot of potential in the movie and it stopped frustratingly close to where I think it could have gone, and that's usually the kind of movie that elicits the longest posts from me. Again, I wonder how much of that wound up on the cutting room floor. We wrapped up the night by watching the conclusion of "Who Wants to be a Superhero? ", and I mean conclusion and not climax. Anyone who didn't see that ending coming needs to take some remedial courses in "reality" television. I more or less suspected Feedback or Major Victory had it in the bag from day one. If you pegged it from how these programs work and what they needed to be be able to do for the Sci-Fi original movie, I think everyone got what they needed out of the show. I will be picking up my Feedback comic as soon as it hits the shelf. I'm curious to see what they do with the character and if Matthew, the guy who dreamed up Feedback, will be involved in actually writing the comic in any way. After all, he dreamed up the character, but surely made the classic comic creator mistake of signing away the rights to a franchise when he signed the form to appear on the show at all. So today was one of the most stressful days of my life. Steanso knows all about what's going on. The stress is (thankfully) not Jamie health related, but rather housing related. But we knew when we decided to split from AZ that moving would not be free of its obstacles and traps. So yesterday we realized that the folks we were two signatures away from buying a house from had decided they didn't want us in their house. The why's and what's will always remain a mystery, but as of 10:30 this morning, we had no place to live or drop our stuff at when we got to Austin. We're now in a race against time trying to find a place to hang our hats when the truck arrives in Austin in mid-September. But we may have already found a place. Jamie is taking point and is heading to Austin this weekend, and with trusty realtor Kerry R. at her side, we may be doing better than ever when we put down our sorry-selves in A-Town once again. Last night I was exhausted when I got home, and Jamie declared she had a "mystery" destination in mind for dinner. I was very hungry and too tired to really care where we wound up. Jamie isn't usually so mysterious, but unfortunately for her, I was a bit too punchy to be intrigued so I just loaded myself in the car. Even more unfortunately Jamie had remembered the wrong major street that our mystery destination was supposed to be, so as we wandered around the Gilbert/ 60 intersection, she revealed we were going to Golden Corral. We all have our little dining quirks. Mine is that I love a good diner, hamburger stand, or anyplace where there's a lunch counter and hot coffee in clear view. Jason refers to this sort of place as being "Marge", a term coined in the 1990's defining tome "Generation X". I especially love independently owned and run diners, but that's a fast dying breed. So I usually settle for a Denny's when i'm out in the burbs. Jamie has a secret love of the food-trough buffet. She probably won't even really cop to it, but she does enjoy the food-under-a-heat-lamp environs and the ability to be picky as she wants to be and just toss whatever food she selects but doesn't like. Or something. I also am partial to some buffets, mostly out of nostalgia for hanging in line with Grandma at The Bonanza on Sundays after church, and, of course, hitting the Luby's with the blue-hairs. But those places didn't really invite you back to the trough the way Golden Corral welcomes you, extending an open-armed invitation to gorge yourself until your eyes fall out of the sockets. And so it was that we wound up at the Golden Corral last night after a twenty minute delay of circling the wrong intersection. It was 7:40 by the time we parked the car and I saw a contingent of retirees hanging out by the front door. "Oh, crap. The line is out the door!" "Yes!" I pointed. "The freakin' old people are swarming the Golden Corral!" We got out of the car to check the situation. The old people were, in fact, swarming the front door, but they were fat and sated and just having some chit-chat before they went their separate ways for the evening... free to go home and watch Matlock or whatever. But the line extended directly to the door, and it curved around a bit inside. "The people are crazy for the Golden Corral!" Jamie excalimed. "It's 7:40. This isn't even the rush time." Jamie knows my patience for waiting in lines is short, indeed. Especially for food. Her dream of a meal at the Golden Corral was over. No dessert bar for her, not when we had fifteen other resaurants to go to at the same intersection. "Where do you want to go?" the dinner question which plagues any couple who has been together more than two weeks. "I don't care," I sighed. I was really hungry. I'd had only a few minutes for lunch and had a pretty slim lunch between real estate issues and a meeting. And then, like a beacon in the darkness, Jamie looked across the road and saw "The Old Country Buffet". There is a law of nature that states that you can place two identical restaurants side-by-side and one will ahve a two-hour wait and one will have immediate seating and a bunch of staff hanging around looking bored. Locally, I often think of "The OG/ Pomodoro Paradox". In our neck of the woods, Olive Garden sits across the street from a fairly decent pasta place "Pasta Pomodoro". The food is similarly priced and probably a little better, and definitely better for you. Olive Garden seats probably four times as many people at once, and usually has an hour wait on weekends. Pasta Pomodoro usually has immediate seating. Old Country Buffet was mostly empty. At the door I was greeted with multiple card board cut-outs of the not-quite-in-the-cultural-lexicon mascot of the Old Country Buffet, The Old Country Buffet Bee. I think it used to be the Hometown Buffet bee. I'm not sure why Hometown Buffet would change it's name and nothing else, but my mind whirled at the notion of the corporate shenanigans which no doubt took place to merge several similar family buffet-style resturants and keep the identity of the bee intact. There's not a lot of screwing around at The Old Country Buffet. There's no menu of specialty meat items for you to select from, or a Luby's-like line to pass through. You hand the dude at the door a surprising $11 a head, and after that: It's Thunderdome. Oh, and they were playing "Do the Hustle" when we entered, so I started doing The Hustle, but Jamie asked me to stop. I love familiar dance tunes played completely out of context. There was enough food to feed a battalion on the buffet, both healthy and deeply unhealthy choices. Rather thant describe what was available, I'll just state that it didn't seem like a good place to take a kid who'd recently been diagnosed as diabetic, so I hope nobody was there putting their little diabetic kid through torture. But I guess the point is that, really, this was exactly the same place (more or less) as Golden Corral, located just across the street, and Old Country Buffet was clearly not going to make a profit this evening. Just in required staff alone to prepare the mountain of chow, I couldn't see how they were keeping the doors from being shuttered if this was their usual take on a weeknight. What is the allure of Golden Corral that Old Country Buffet was clearly lacking to the line of eager diners across the street? Is the food actually better? Is the music selection more appropriate (this I doubt as my last voyage to Golden Corral in 2001 all the kids at the table behind us stopped mid-meal to listen to Celine Dion's "The Heart Will Go On" after a hushed exclamation of "Titanic!" "Titanic!" "Titanic!" rippled down the table)? Are the chairs more comfy? The lights appropriately dim? The folks at the OCB seemed happy enough, both staff and customer. A family was having a fairly anti-climatic birthday party for one of the women identified as "Mom", but I wasn't sure who she was. All in all, a fairly harmless place. But God bless you, Old Country Buffet. I have never seen a finer array of fried and carb-heavy goods on display. Leaguers, I admit I got a little squeamish this weekend when it came to another taste test and never pulled the product off the shelf. Jamie and I went to get a sno-cone last night. I got a "Batman" flavored sno-cone. I queried why they had a Popeye and a Batman flavor, but no Superman or Wonder Woman flavor... the jughead teenager behind the counter responded with "Huh huh huh huh huh... I dunno." How did Batman flavoring taste? I tell you Leaguers, it was the delicious taste of justice. And that is exactly what I told both Jamie and the kid behind the counter. At the sno-cone shop they have candy, which is where last week's Mallow Dog was discovered. This week they also had Mallow Burgers and Mallow Fries. I was going to have another mallow meal, but I think I've already done my due diligence on mallow shaped into a form resembling foods which I enjoy in their natural state. I think we're on a good pace for packing and being ready to go on the 14th. That's when the movers are showing up. We've now gotten to packing pots and pans and whatnot, so we can't easily cook anymore, so most of my meals will be sandwiches, cereal or out of the microwave. I also think we've reached a point where we're just a day away from agreeing on our closing on a house in Austin. Now... to find a job. I've never made a secret of my love of the mid-90's cartoon Animaniacs. Most people remember Pinky and the Brain and the Warner Siblings, but the show was more or less a variety show with a rotating bunch of shorts. Rita and the Runt (a singing cat and a Rainman inspired dog), Mindy and Buttons (a play on the classic "baby in trouble" cartoons), Goodfeathers (a Goodfellas inspired pigeon cartoon), Slappy Squirrel (a retired cartoon star and her nephew), Mr. Skull Head, Katie Ka-Boom, the Hippos, Minerva Mink, Hello Nurse, Doctor Scratchnsniff, and, of course, Chicken Boo. The show worked off the theory that if you tell a joke every ten seconds, it doesn't matter if 2/3rds of them are groaners or stinkers... it's all about keeping pace with the dialogue and visual gags. Anyhoo, as Nathan pointed out in the post with video below, there's really nothing like it on TV today. Kids cartoons are mostly poorly animated, cheaply produced (and generally unfunny) stuff that relies on lots of screaming and gnashing of teeth in a diluted 3rd generation Ren & Stimpy fashion. Or, of course, the imported anime stuff. Some of which is okay. Other shows are inexplicably popular, like Yu-Gi-Oh, which is a cartoon about people playing a dungeons and dragons-like card game and doing a lot of smack talking. Whatever the kids like, I guess. So, Randy had pitched the idea of a "Friends of The League" site. I asked last week what you guys might do with such a site as I wasn't clear on what Randy was getting at. I think the comments section pretty much covers the necessary territory. Also, honestly Leaguers... my life is not a TV show. I'd like to think I'm thick-skinned, but I'm also not sure I'm comfortable with the idea of a forum for people to critically analyze my life. That's creepy. But, hey... what the heck... if it all went to heck I could tell you guys exactly where you could stick your @#$%ing website, right? 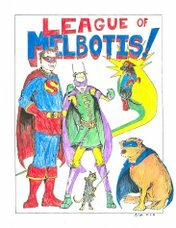 So, Friday night I went on to Blogger.com and spent the prerequisite ten minutes to establish a new blog, dubbed it "Hall of Melbotis", and invited a few Loyal Leaguers to join. I had no idea what would happen. Well, nothing happened. Of the seven or so folks I asked to respond, only Steanso showed up, and that was more or less to insult me and then disappear. Which is sort of how he was involved in my life from 1991-1995. It was like old times. Leaguers, thus ends the "We should set up a website for Friends of The League!" experiment. Randy, you really, really, really, really just disappointed all of us. There's a good documentary show that's been running on Sunday evenings on the History Channel. It's about the Revolutionary War, and is aptly titled "The Revolution." You guys would dig it. For the first time in weeks I actually got a chance to read all of the comics I picked up on Wednesday. Well, all of the new ones. It's been that kind of busy at League HQ. I'm also busily putting comics in long boxes in the right place for the last time before I move. After the boxes get closed and taped up, that's it until we hit Austin and unpack fully. All new comics will go in a single longbox for a while until I can sort through them and re-organize. I've come to the sorry realization that my genre/character/ publisher organization system is no longer realistic nor adequate. I may actually have to alphabetize. It doesn't probably seem like a big deal, but the genre/character/publisher system is how I've been sorting comics since I was 13 or 14 and got my first long box. (I still have that box. It says "Ryan's comics! Keep your mits off!" in fat black ink). It's too bad, because I was looking forward to those series in the OYL jump. But I'm basically not enjoying any of the three series. I have pedged to pick up the NEXT issue of Supergirl as they appear to finally be getting down to brass tacks and establishing some sort of environment for her to operate in. I really, really don't understand how they've gotten 10 issues in (and something like 3 years since her debut) and nobody has noticed that there's no character established yet. I'm a little peeved about the Steve Englehart thing as I appreciate that the guy was important to DC 25 years ago, but his Batman story last year was mediocre and his runs on JLA: Classified and JSA: Classified were pointless, dull, and reminded me of why I didn't read DC in the 80's. And if he keeps popping up in comics I collect on a subscription basis, then I have to think about things like breaking a run on a series and cancelling and restarting a subscription. Blue Beetle was on the chopping block until issue #6 when someone finally DID something. This book needs to have a better editor or else someone needs to explain to Keith Giffen how to establish a story before you drop your reader into the middle of the action. I'm not sure why, but the insistence to get to the action without establishing why we're there seems to be a pretty common flaw in a lot of comics, even by veterans like Giffen. Which brings us to Meltzer's Justice League of America #1 which I said nice things about last week and I'll say nice things about this week. I read one review which stated that the comic was already detouring into a "soap opera" with the Red Tornado storyline. I'm not sure when fleshing out characterization and giving characters motivations became a "soap opera", but I thought that was a pretty poor reading of what was a pretty darn good comic. Of anything done since the end of Infinite Crisis, this series is impressing me the most, and we've only had two issues (there was an issue #0... it's sort of tough to explain). The point being is that there's a conflict being presented before we come to fisticuffs.